Back from the dead -it’s the Sunday Scan! This is Michael Golden’s dynamic cover to Marvel’s Micronauts #38 (1982). 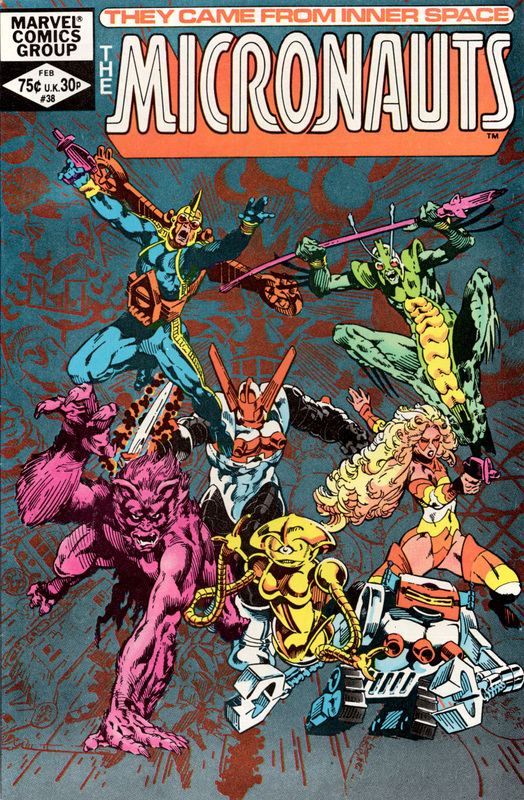 No one did the Micronauts better than Michael Golden. After he left the title as series penciller it had a procession of good artists take their turns but none ever equaled Golden’s work in my opinion. Every now and then he would do a cover like this one and I remember it being SOOO AWESOME. This was long before the publicly accessible internet so comic news and rumors were pretty hard to come by, so when we fans seen a new Golden cover we HOPED like hell the interiors would be his return to the series. Upon opening it up we were always disappointed as he never came back to the Micronauts beyond an occasional cover like this one. I love Michael Golden’s artwork! That X-men / Spider-man storyline in the first issues of Marvel Fanfare was especially good.